Summer is here and the time is right for getting into the holiday spirit with some red, white, and blue! 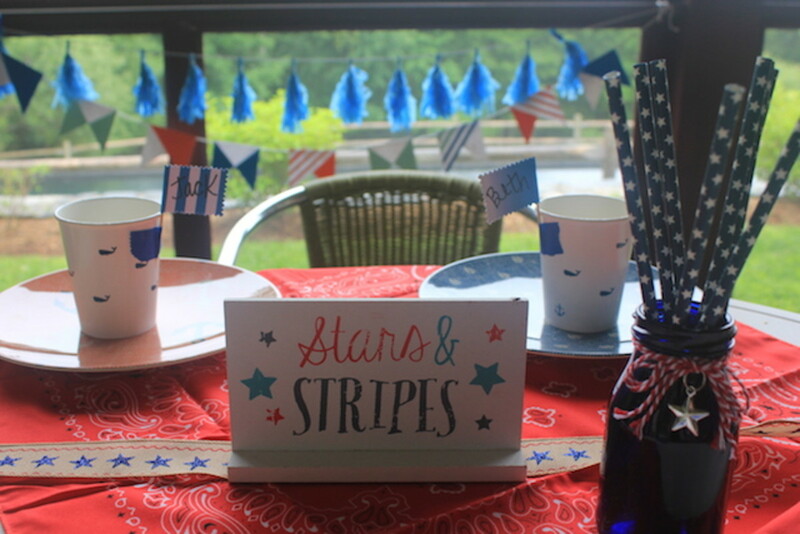 We put together this patriotic party for adults and kids using the traditional colors with a twist. Let&apos;s talk table settings. I&apos;m not one for big centerpieces at parties because they usually get in the way, get damaged, or are a cause for distraction during meal time. I chose to scatter several bandanas across the table instead of one tablecloth, then added star studded ribbon down the center of the table. This Stars and Stripes wooden sign was found at Target in the dollar spot. (shh! No one will know since it&apos;s so stinkin&apos; cute). 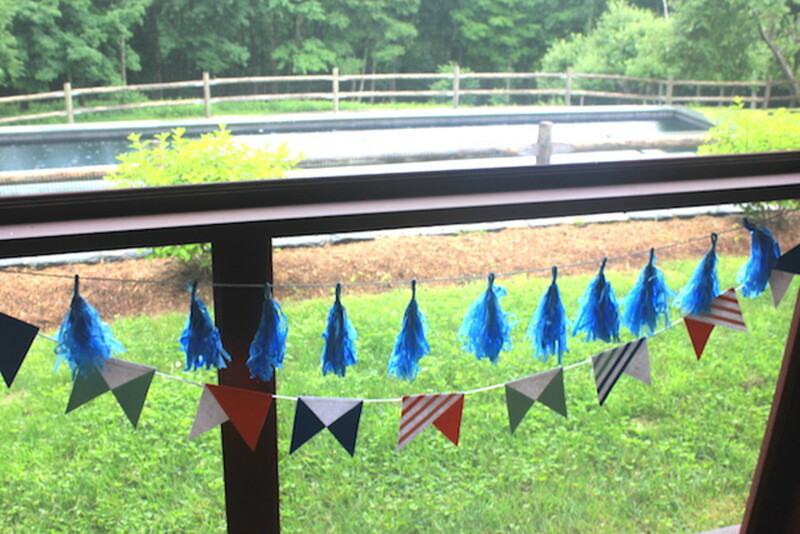 Behind our table I hung two different buntings: one tissue paper tassel banner and then a paper bunting right below it. I love to layer these like necklaces---different textures and different colors in the same scheme keep it interesting and inviting. 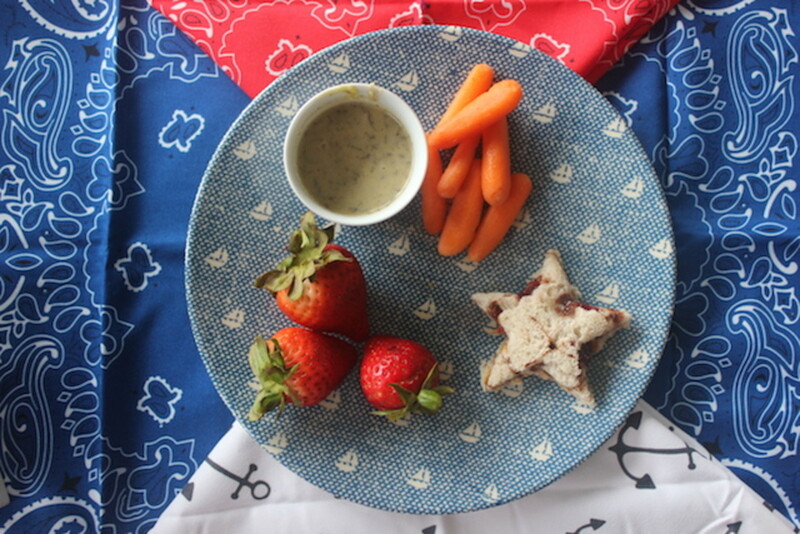 I chose plastic plates with nautical patterns and paper cups with whales. 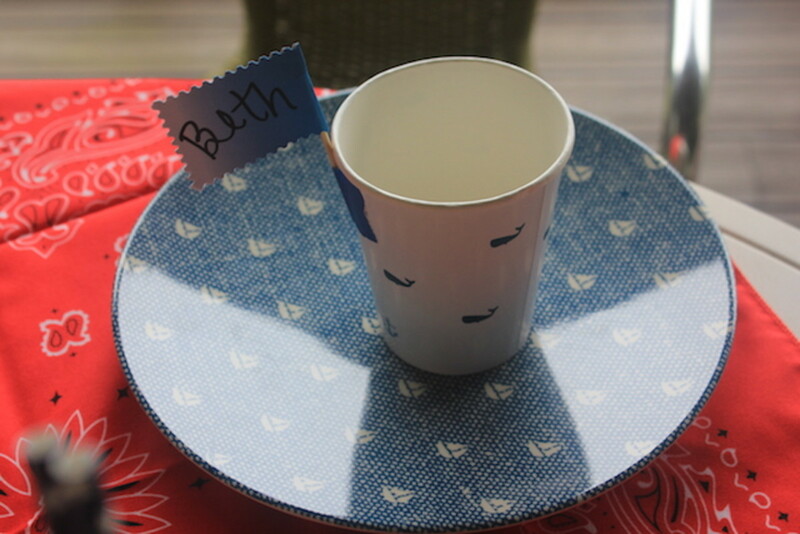 I attached tiny paper picks to each cup with the name of a guest with some colored washi tape. 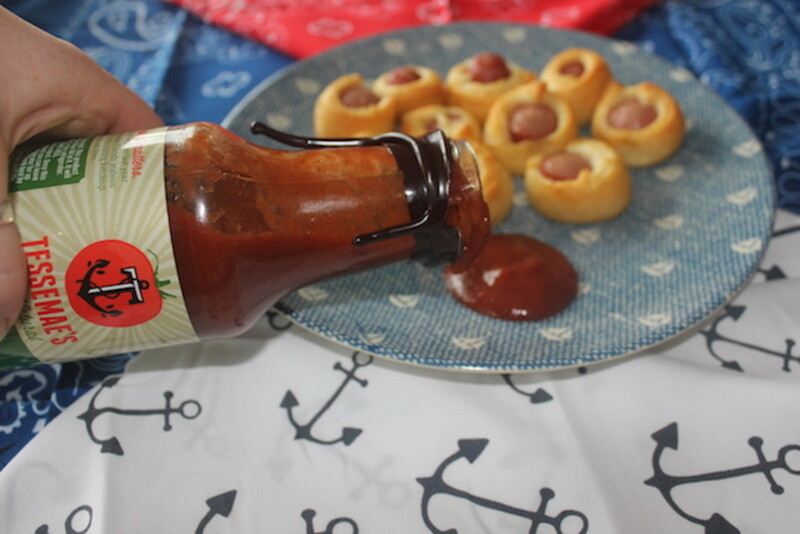 The kids snacked on fruits and veggies, star shaped peanut butter and jelly sandwiches, and pigs in a blanket with condiments from Tessemae&apos;s. These condiments are special in that they don&apos;t use any refined sugar. 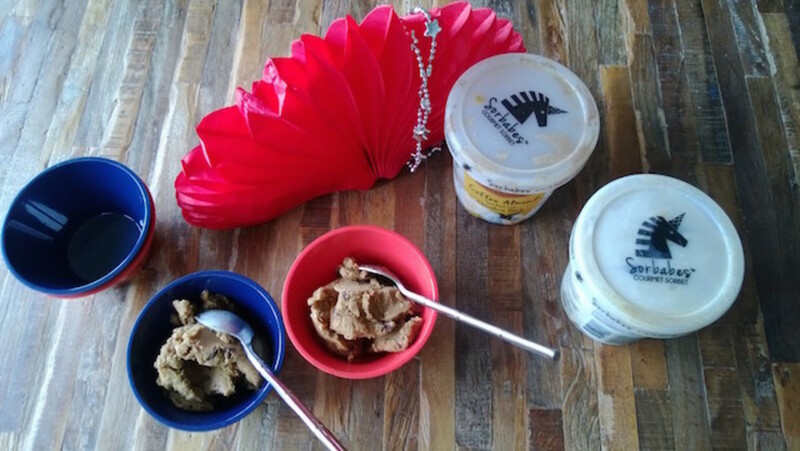 Instead, they use homemade date puree to naturally sweeten their products. They are all non-GMO, are never frozen, and almost each one is Kosher! There&apos;s no easier way to get your child excited to eat their vegetables than with these delicious dips and sauces. 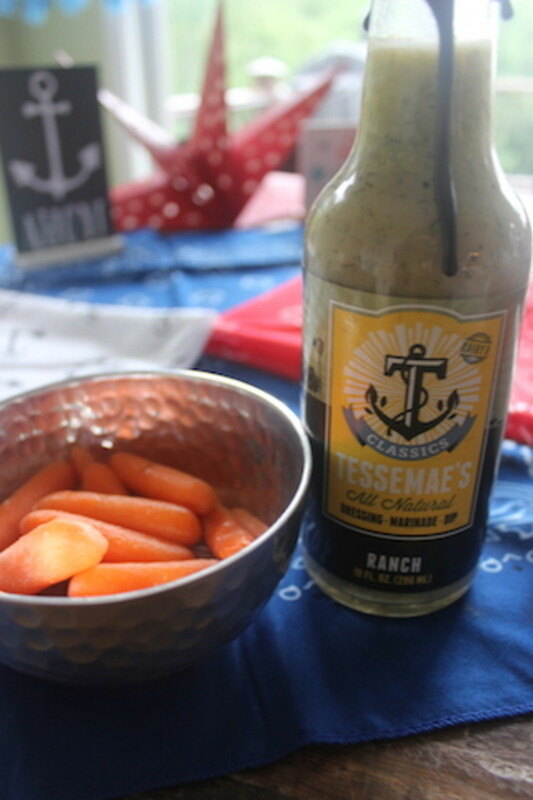 Tessemae&apos;s Ketchup is not too sweet and doesn&apos;t give you the feeling of artificial tomato sauce. 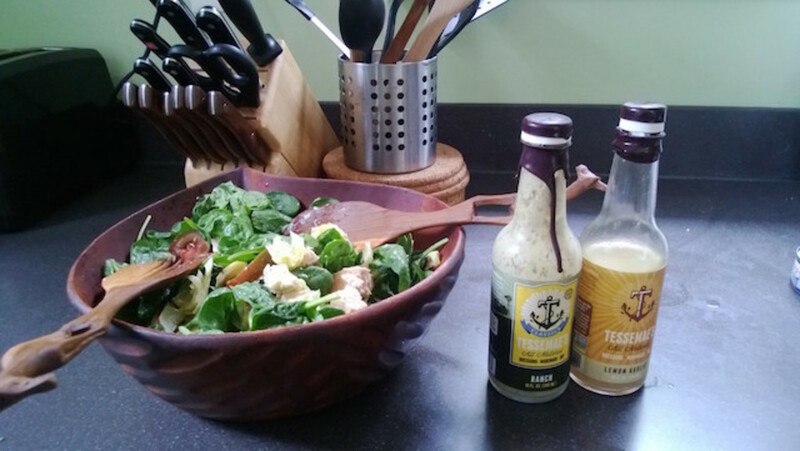 And their Ranch dressing? Out of this world. Don&apos;t worry, grownups, we didn&apos;t forget about you. We have just the treat for you while you&apos;re enjoying the heat---a delicious concoction using Sorbabes sorbet and Goslings Rum. 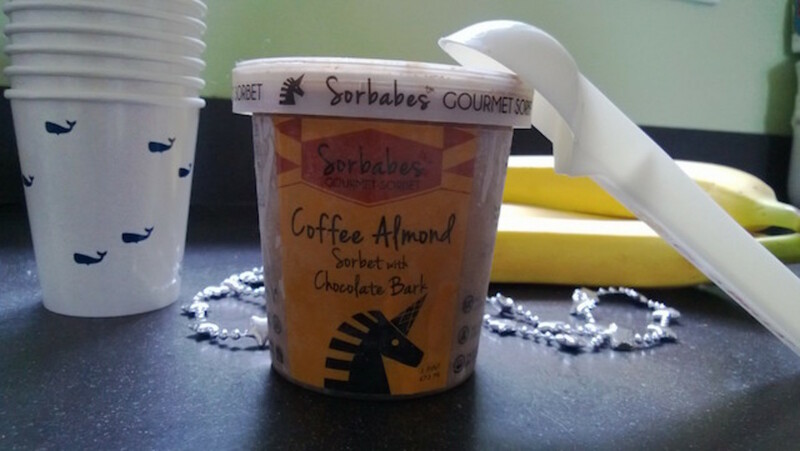 A healthy, balanced lifestyle doesn&apos;t mean skipping dessert and with Sorbabes Gourmet Sorbets, you&apos;re getting a mixture of intensity and fun. They are Vegan, Non-GMO, no dairy, no soy, and incredibly satisfying. The flavors (the pistachio with sea salt caramel is a MUST) blend into drinks but mix well with other Sorbabes flavors as well. 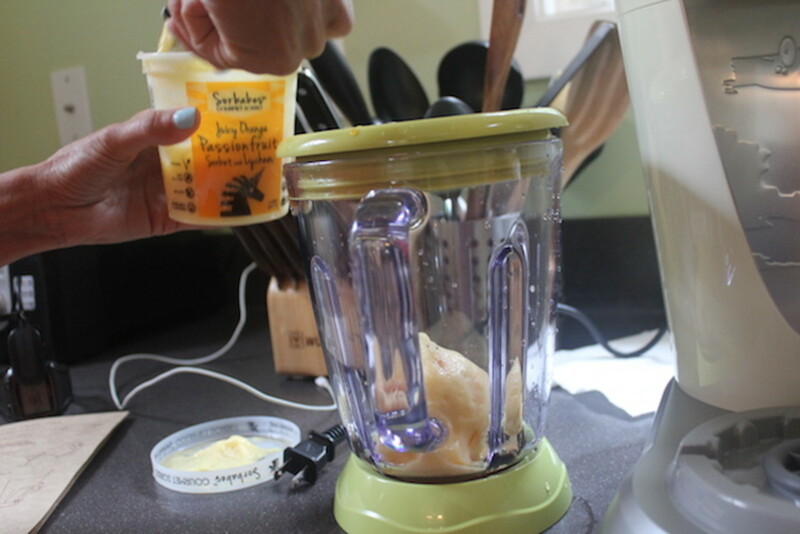 We blended four ounces of Rum with a pint of Sorbabes Juicy Orange Passion Fruit sorbet (Soooooo tasty on it&apos;s own) with some ice to create an adult slushy. 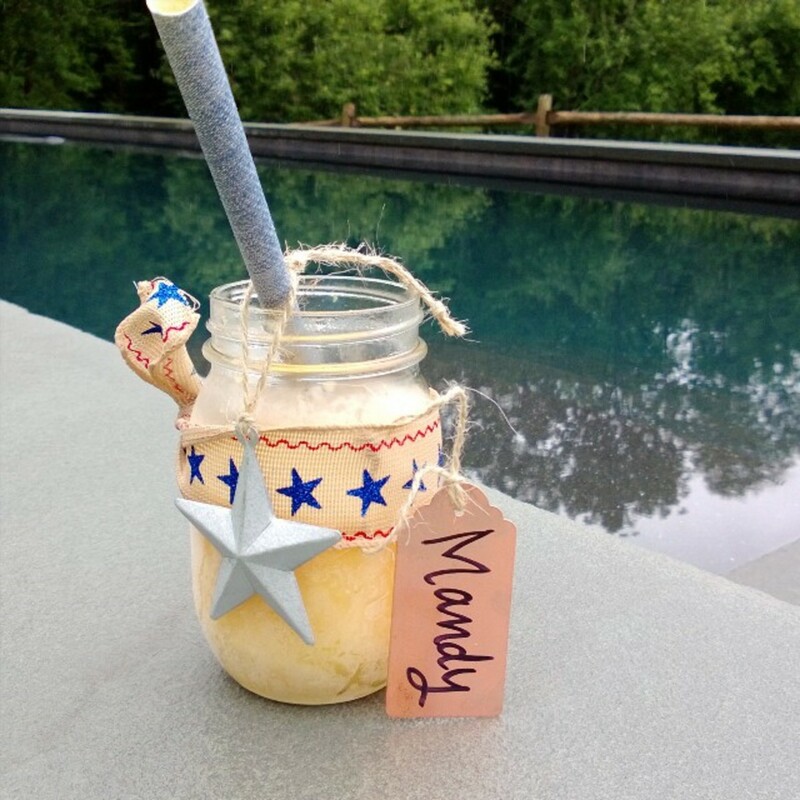 We tied some ribbon and a metal tag around a mason jar, added a paper straw and BOOM---you&apos;ve got yourself one yummy cocktail. A fun activity in between eating and swimming is a patriotic nail bar. 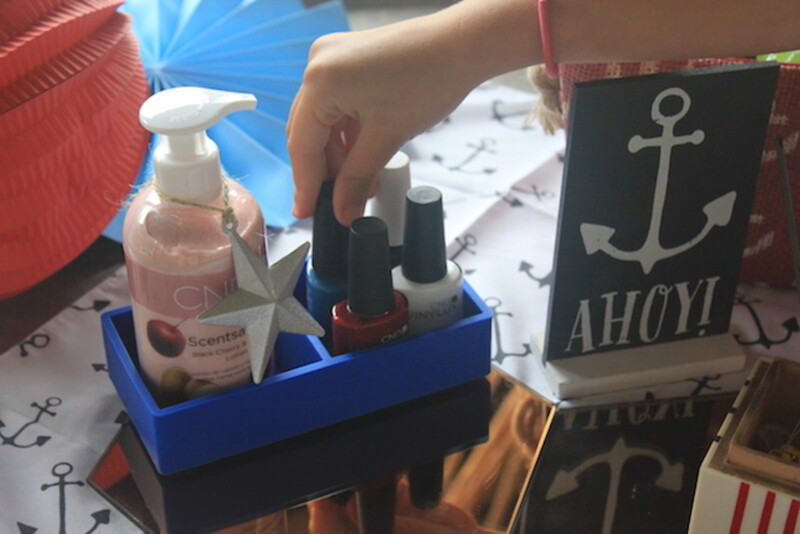 We set up this quick nail station with red, white, and blue polishes, plus some kid-friendly beverages and snacks. The mirrors are from IKEA and give your table a little bit of a "salon" look. 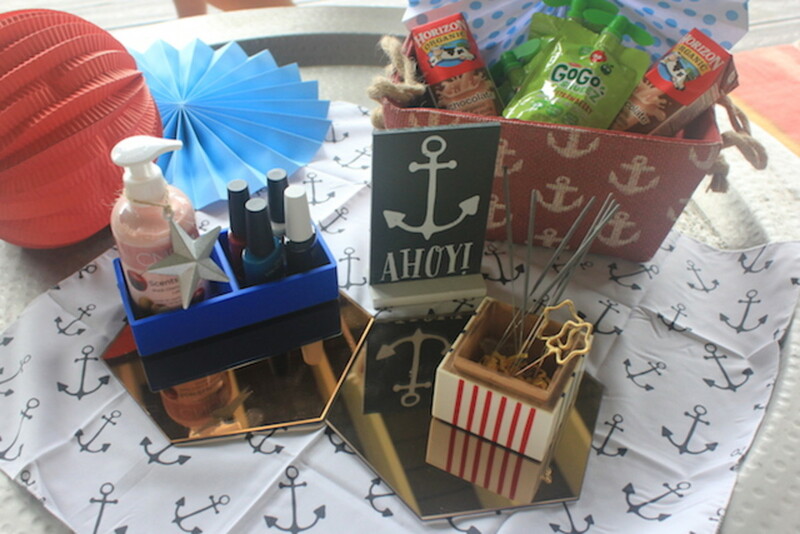 We also added cute sparklers in a colorful box to give waiting partygoers something equally fun to do. Another find at the Target dollar spot were these flag window clings. 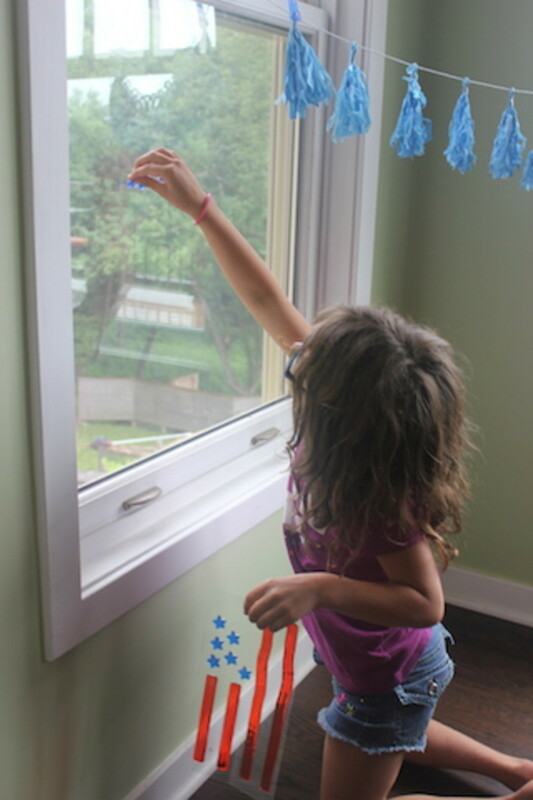 Kids will love to add these onto the windows (refrigerators, televisions, cups, doors....) and it&apos;s a great conversation starter. Get your kids talking about the meaning behind our nation&apos;s flag, what the colors represent, and history of the holiday. Don&apos;t forget to send your guests home with a parting gift. 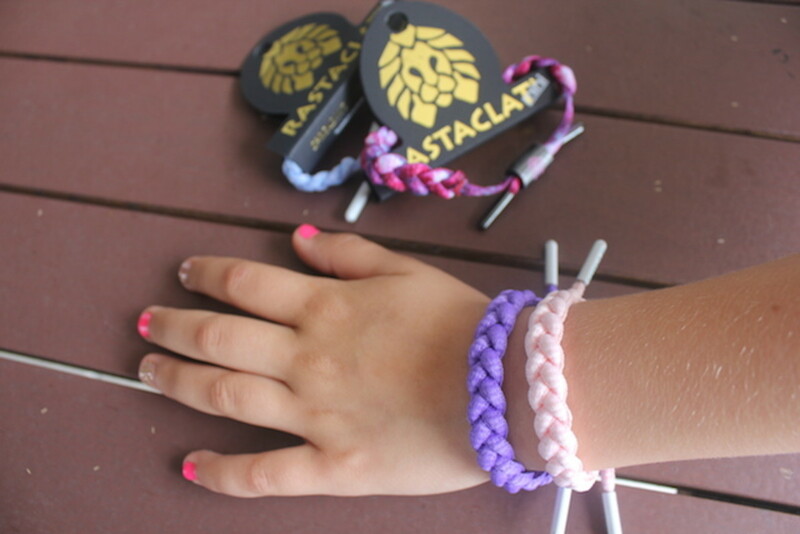 These shoelace bracelets from Rastaclat are perfect for both boys and girls, men and women! They come in every color under the sun, are simple to put on, fun to trade, and easy to accessorize with other pieces. Our 7 year old tester was in love. We hope you have a very happy 4th of July! Be sure to subscribe to our YouTube channel to see more of our It&apos;s A Party features.